I have always been fascinated by maps. On returning from family camping holidays in France as a boy, my dad, a photographer by trade, would create a big photo album of our adventures, and in pride of place at the front of these albums he would stick a photostat map of France that detailed our journey. My father had itchy feet on holiday and we would rarely stay in one location more than 2 days before he bundled the five of us back in our rusty old Fiat van to trundle off to another site of interest. I think between the age of 8–14 I must have experienced most of France over 2 week periods every summer. Now days Claire and I mostly holiday in the UK, and as we near the date of departure we always buy an Ordinance Survey map of where we are heading and study it intently. It has become a bit of a ritual which I think harks back to the family holidays of my youth. This information is given as background to the fact that I have recently come across several personal coincidences featuring maps. Two weeks ago it was my mother’s eightieth birthday, and struggling to think of what to get her I struck upon the idea to take her to Norfolk on a trip down memory lane, (my family had relocated there from London in the 1960s, and as a result it is my county of birth). The obvious way to physically give this as a present to my mum—with the date for the intended trip yet to be arranged—was via a map. 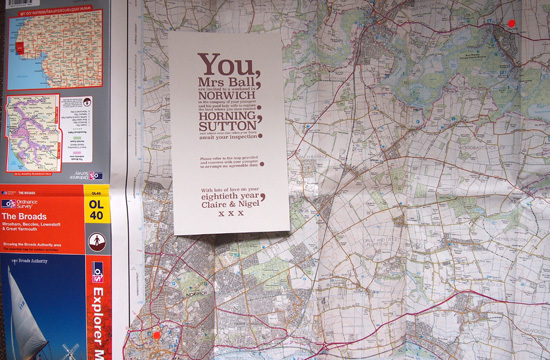 So I bought an Ordinance Survey map of The Broads, some stickers, and wrapped them up with an instruction card informing her to choose the locations she wanted to revisit. 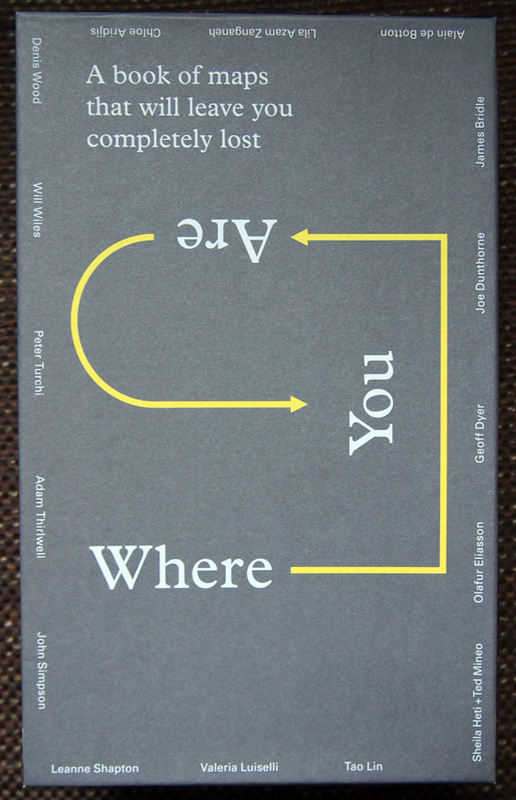 The coincidence of maps on that weekend happened when early on the Saturday morning, prior to making my mum’s card and wrapping her present, I had to go to the Post Office to pick up my order of Where You Are by Visual Editions, a book / box of maps by “writers, artists and thinkers … each one exploring the idea of what a map can be”. The coincidence was cemented in my mind when sitting down to look through the Visual Edition maps, still prior to creating my mum’s card, and realising another book on my studio table waiting to be read had a map on its front cover. This book about typography and printing was published in 1947 by the long gone Cowell’s printers in Ipswich, which I had been prompted to buy the week before after reading Ruth Artmonsky’s excellent Do You Want It Good Or Do You Want It Tuesday: The Halcyon Days of W.S. Cowell Ltd. Printers. The former of these two books, Where You Are, really stretches the traditional concept of what a map actually is and how maps can be interpreted. I was particularly taken with Valeria Luiselli’s beautiful and mysterious Polariods in her map: Swings of Harlem contained within Where You Are, in which she photographed her daughter on every set of swings in every play-park in Harlem. In her text accompanying these images she passes detached thoughts on the location, the procedure of getting to the park, and her own mood as she watches her daughter play and eavesdrops on other people’s parent–child conversations. I got to thinking about the concept of psychogeography as I read Luiselli’s piece over the following week. In particular I was considering how we can approach the world around us in a detached manner, forming our own maps of our circumstances and psychologies, and how these can differ greatly from maps produced with the purpose of trying to give order to the world around us. Feeding into this thought process was a post I read in February on Al Jazeera America questioning why the north ended up on top of the map. 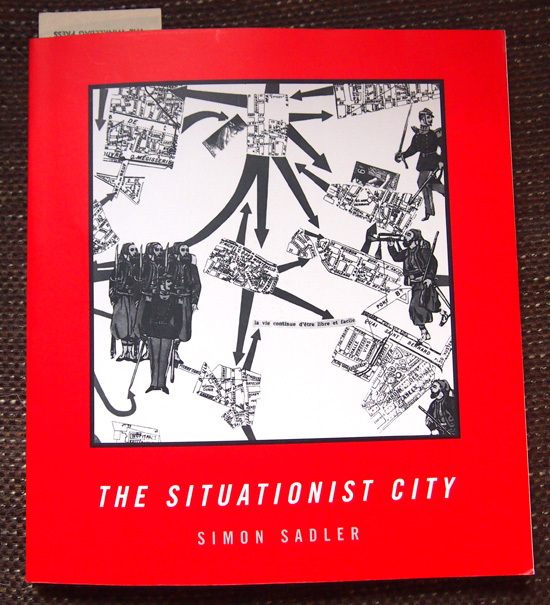 This led me to dig out The Situationist City by Simon Sadler, a book that had been sitting on my shelf unread since I bought it last year. 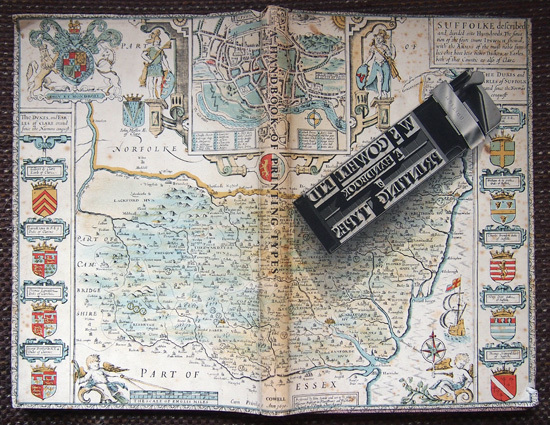 The cover of Sadler’s book features Guy Debord’s 1959 psychogeographical map, of which the author says: “…made as part of Debord’s correspondence with his situationist colleague Constant, the piece was a tiny gem of situationist pot-latch (art created as a gift) and détournement (art composed from ‘diverted’ aesthetic elements).” This image in turn reminded me of a catalogue cover I had produced 12 years previously for a graffiti art-trail of Ipswich I curated. The project’s intention was to question what could be constituted as an art gallery and the cover image I designed openly and appropriately rips off Debord’s visual concept—appropriate because situationism was never afraid of plagiarism as a concept and actively courted it as an artistic device, as highlighted by Sadler above when discussing détournement. 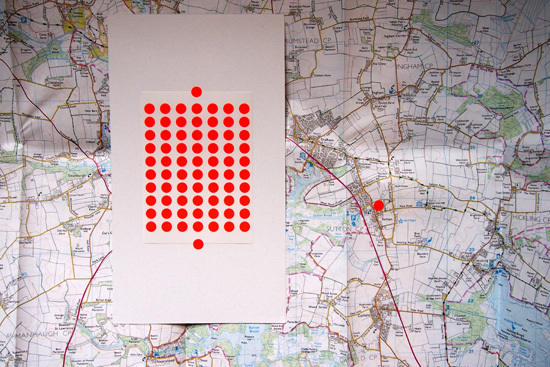 The catalogue, circa 2002, also contained a map I designed, (below), for exhibition goers to follow. 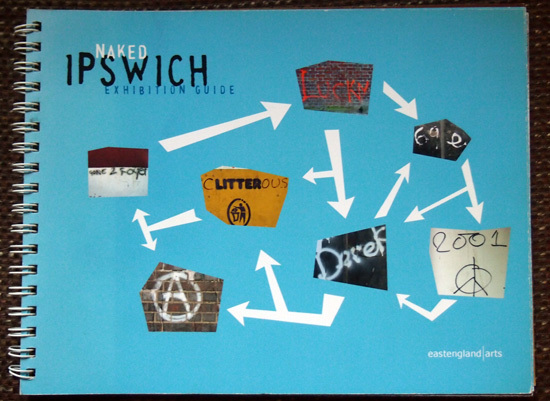 A few years after designing this I realised it was similar to a map of London that NB Studio created, (see link). I don’t know when NB Studio made their work, but if it was prior to my map, I was completely ignorant of it at the time—this is a statement which I realise calls into question my honesty considering my previous comment about Debord’s map, but I swear it is true. Regardless of this, anyone looking at NB Studio’s map will soon agree that my mediocre design effort pales into insignificance in comparison. 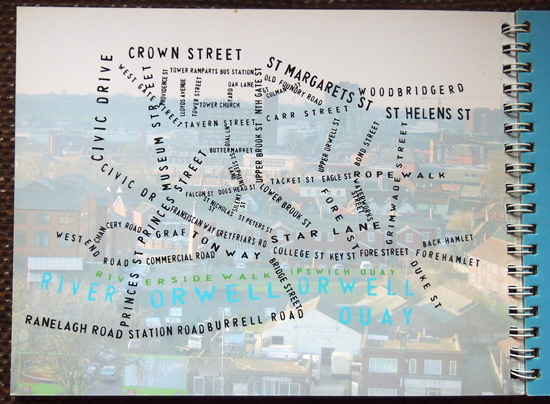 To wrap up all this map talk I suppose that I’ve come to realise that all my recent thinking around the subject has actually been a journey in itself, and therefore, this blog post is a map of my thought processes over the last few weeks. I will be the first to admit that these thoughts and coincidences are somewhat ill formed and disjointed at the moment, but I’m currently ruminating on many different thoughts with the hope of formulating some of the more interesting ones into a future project. So without wanting to force a pun, I haven’t come to the end of my journey in this matter, and I fully expect to return to it again here in the near future. However, it is probably worth pointing out an irony from the starting point of this post. On the way to a celebratory meal in a pub for my mother’s eightieth birthday on the evening of the aforementioned Saturday, at which my childhood fellow French adverturer brother and sister were going to be present, Claire and I got completely lost on the drive there, too reliant were we on Apple’s iPhone Maps app!